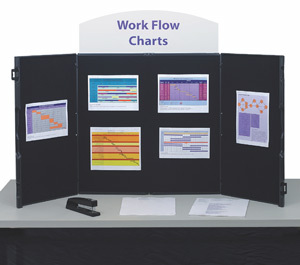 The ShowStyle Tabletop Display carries like a briefcase and opens up to provide a 48" × 24" display area. Display stays in place and protected during transport. Hook and Loop receptive fabric in a variety of color choices. Includes blank header. Measures 5" × 26" × 14" when closed.